You would be quite surprised at how many churches have multi-age Sunday School classrooms. I once visited one where there were two first graders, two third graders, and a fifth grader. Wow! When asked to help them out I did a little research and put my thinking cap on and came up with some tips for teaching multi-age Sunday School classes. Ensure that the lesson plan is interactive: Use varied instructional strategies: lots of visuals, movement, hands–on activities, videos, role playing, listening cues for Bible passages, picture books, music, etc. Factor in attention spans: Studies indicate that a child’s attention span is generally one minute longer than their age. A six year old might be able to focus for seven minutes. Plan accordingly. Provide a teacher directed activity then a child-directed activity and repeat. Provide structure they can count on: Younger children especially thrive on routines. Build them in to every lesson. 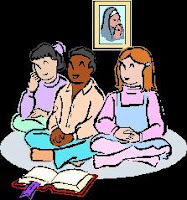 Utilize activities such as an opening prayer, an ice breaker, a Bible lesson, game, art project, and prayer. Be consistent, but allow for creativity within the structure. Utilize the older child in a leadership role: Allowing the older students to help builds responsibility, character, and maturity. Invite them to distribute supplies. Use their specific individual gifts to help teach. Have students read passages or picture books if they are confident readers. Have older students provide music accompaniment in worship or create artwork as a visual for your lesson. Pair up different age students for craft projects. Many times we do not attempt complex crafts with younger children because there are not enough adult helpers. In a multi-level classroom you have an advantage, which age-separated children’s ministries do not; you can utilize the “big buddy” to assist their “little buddy” in completing the craft. They can work on the craft together! Be sure to ask questions for the kids at every age level. Asking questions is crucial to deepening understanding. Make sure you hit the appropriate level for students at each age. Students will become very bored if you don't challenge them at their own level. Be sure to have them all pray out loud together. The younger kids will have a great influence on the older ones and their confidence in praying out loud. I know... you thought I'd state that the other way around but as kids get older they become less and less comfortable praying out loud. Use the opportunity to keep them young in that way! Enjoy your multi-age classroom and watch them as they interact and teach each other about both the Bible and the love God has instilled in their beautiful hearts. Thanking God for 10,000+ Page Views!! !